All right, in this video, we're gonna start to talk about the golf downswing movements, and more specifically, this is gonna be the introduction to when we start to talk about the muscles that we actually use during the down swing and the sequencing. I've got two golfers up here that illustrate how to do it right now how to not do it so right. I've got Tiger Woods on the left and Skip Kendall on the right, both are great golfers, great ball strikers, have had relatively good careers. Obviously nobody's great compared to Tiger, but Skip's made a living on the tour for a long time. I know Skip, he's a great guy, I've watched him hit balls a million times out at Keene's Point. The thing that's interesting about these two is you can see where things go really wrong really quick just due to not moving in the right sequence and not moving from the right places. Especially with the rotary swing tour, when we talk about all these details and the downswing, this is gonna really help you illustrate and understand why we want to move a certain way, and why we want to move in a certain sequence. The thing that we're gonna talk about today is this infamous term of getting stuck. There's several ways you can get stuck in the downswing where the club gets trapped behind the body and you end up having to come a little bit too far from the inside and try and flip the face to square it. In this video, we're gonna see that it's primarily due to, we talk a lot about the pushing versus pulling. You're gonna see that in this where Skip tends to open his shoulders a little bit early as we start the downswing, you're gonna see that his shoulders start to unwind pretty quick and you're gonna see that right shoulder pop out from the right side of his head pretty early. Tiger, granted Tiger's made a little bit more of a turn here, which is gonna help. But the big thing that you're gonna see is that when their arms are about in the same spot, get just a little bit closer. Tiger Woods' right shoulder, you can almost still see it on the left side of his head. This is because he's not pushing from the right side of his body to open his shoulders early. When I get into demonstrating this in the next video, you'll see this a lot more clearly. When you start to unwind your shoulder early you start to drive your right shoulder into the ball or toward the target line, and your shoulders unwinding early. Instead of you working from the proper musculature to pull your arms back in front of your chest, which is what Tiger's doing. You've heard Tiger talk about a million times, he feels like his arms are just falling at this point to get back in front of his body. Well that may be what he feels, but that's not what is happening, because there's no way, as fast as he unwinds his hips, that the arms would just naturally fall back in front of the body, you have to actively pull them there. Gravity's gonna assist a little bit, but when you're moving that quickly, you have to actively use the left side muscular and the right side, we're gonna talk about in the next video. We're gonna talk about the right peck, how it works, and the left lat, and the left rear delt, that are all gonna help pull the arms back in front of the body so that we end up with the arms back in front of the chest so we don't get stuck. As we're gonna see Skip here in the next coming frame. I'm just gonna keep moving them through here slowly, and you're gonna see when their arms are both parallel, Tiger has a lot more lag here where Skip has lost it. You can really see his right shoulder here, it's really opened up a lot. His shoulders are open a lot. If we had a down the line view you'd see his shoulders are very, very open, and we'll look at that in another video. You can see that his arm is really pinned against his chest here whereas Tigers is starting to work back out in front of his body. You don't see it strapped across his chest here like you do with Skip. Skip is basically just turned into his left arm and now the club is trapped behind his body. He's gonna have to continue to push that right shoulder into and around so that the club will start to get back out in front of his body. Unfortunately, as he continues to push, the harder he unwinds, the more the club throughs out away from him. This is why it's so important to not just unwind your shoulders from the top because you create a throw out motion that's very, very difficult to overcome unless you're very strong. Because the harder you unwind this part early in the swing, the earlier the club wants to get thrown out from the top. It's just a matter of physics, you're creating centripetal force when you start pulling from this left side and turning your torso really fast and pushing from the right, this center part is spinning really fast. The faster you spin this, the faster the centriphical force is gonna take over, and the fast this club is gonna be thrown out away from your body. Whereas in this one, Tiger's kept his shoulders very, very quiet. His shoulders are still relatively, probably 30 degrees more shut than Skips are. I'll try and draw a line here, it's really hard to see this stuff when you're looking at it from this angle, but I'll draw a line through both of his shoulders here. Then try to draw a line through Skips, and it's pretty easy to see even from this angle. If we had a overhead view it'd be really easy to see, but that Skip's shoulders are very open at this point relative to Tiger's and so this is why he's lost all this lag. It's solely because of this reason, because you're creating a lot of throw out force, and I see this every day. People want to get to the top and just spin their shoulders as fast as they can and the golf club gets thrown out from here and they wonder why they're casting and flipping. Well, you can't fight the laws of physics here. There's nothing you can do about it, you're not strong enough to hold that lag nor would you want to. That's not how we want to produce golf swing lag. As we continue to get further into impact here. Now you're gonna see that Skip's right arm is very bent here, it's not straightening out and it's trapped behind his body. As we move Tiger to the same point in the swing, notice how Tiger's right arm is much more in front and connected to his chest, his elbow is much closer to his torso whereas Skip's is lagging behind. Again, Skip's club is trapped back behind his chest, his chest is kind of pointing either directly at the ball or maybe even a little bit in front of it. Whereas Tiger's is still pointing back in this direction so if you just imagined a 90 degree perpendicular line from their chest. Tiger's shoulders are still closed, Skip's are open, and Skip's arm is still buried against his chest. This is the epitome of being in a stuck position. One more frame as we get closer, you can really see Skip's arm bent and stuck back behind his body here. We'll move Tiger's club to about the same spot. Notice there's another huge difference and this is the big key why Tiger can hit the ball so much lower than a lot of other golfers. Is that this pulling motion of using the left musculature to get your arms back in front of your body allows your hands to come down more on top of the ball and allows the club to work back out in front of your body. Which allows you to get a really steep angle of attack even with the club like his three wood to launch the ball. Like that famous shot we saw at Bay Hill in 2008 where he launched the ball like a missile on 18 very, very low without playing the ball off his back foot as most others would have to do. This is another, a good buy product of it again. But you can see again, Tiger's arms are straightening out here, his arms are right in front of his chest. Skip's chest is pointing out this way so he's stuck. Even at impact, his chest is very, very opened out. His arms are still buried against his chest, he never released the arms off the chest. Whereas Tiger's we get into impact, you're gonna see his arms are naturally straightening out in front of his body allowing him to maximize every last bit of speed and is in a much better impact position. Again, it all comes to how we move from the top of the swing. Instead of pushing from the right as Skip is doing here and unwinding the shoulders very fast. You can see he's also pushing off this right leg. We're gonna use the right musculature to get the arms back in front of the body and in the next video, that's exactly what we're gonna talk about. 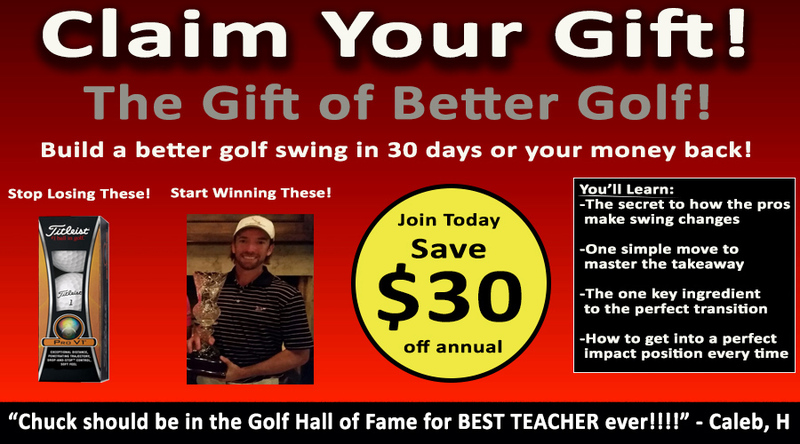 Get Your Free Membership to Finish Watching "Getting Stuck on the Downswing" Right Now!